Oh my…I’m in lust with a new find. Ricos Tacos Moya II here in the city. My Kid had told me about it. I just hadn’t had the chance to go by til today. Pictured: Verde(green) and Roja(red) Sauces both are extremely flavorful,. Frijoles(refried Beans), one each Asada(Steak) and Carnitas(Pork) Taco. This is one happy Angelina(LA Girl). This is what I miss living here. Classic Flavorful Fresh Mexican Food. I will be working my way through the Menu. Next Pozole(Hominy Soup) and then Chile Relleno and then……..and then ????? 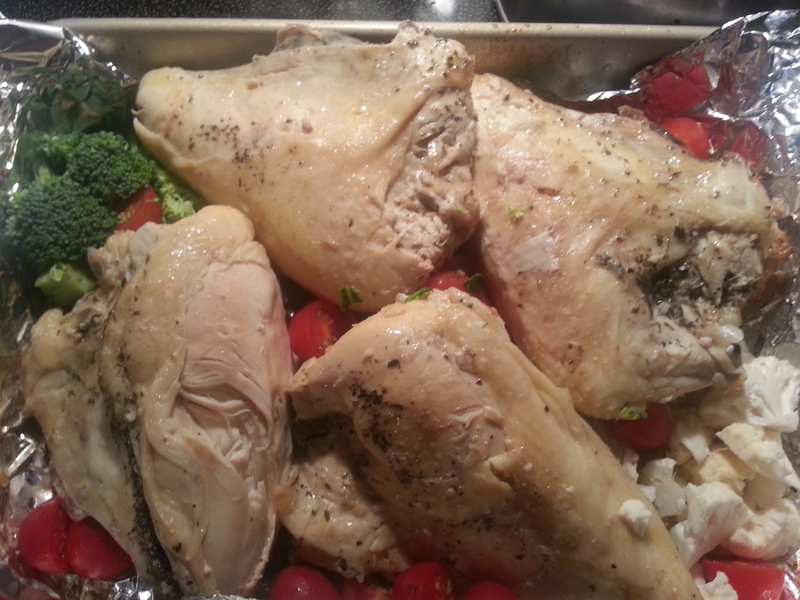 I had an itch for YUMMY baked bottom of the bottle Chicken. I save all the little bits from the bottom of various bottled condiments and mix them all together with either White Wine if I have any or with White Balsamic Vinegar and use the mixture for baking Chicken. It always comes out YUMMY and it is never the same twice. 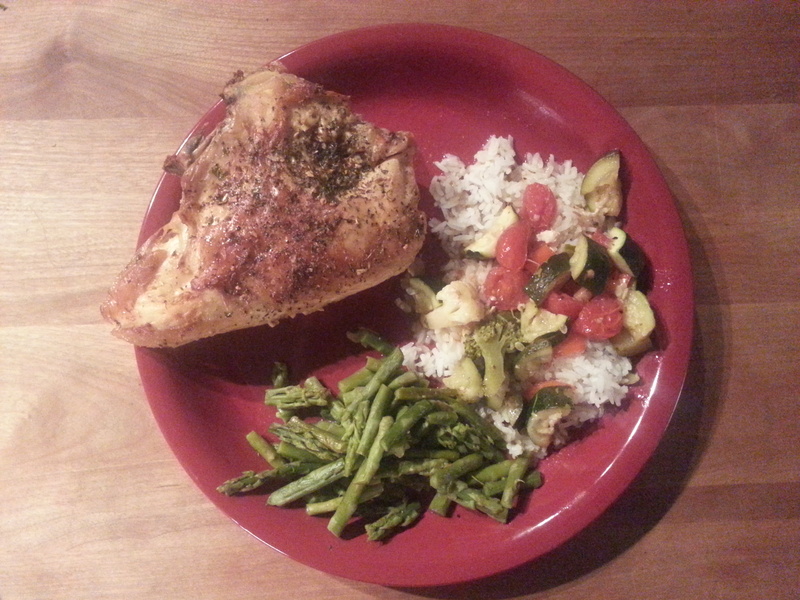 This Chicken dish was made with Creamy Caesar, White Balsamic and Simply Greek Salad Blend. 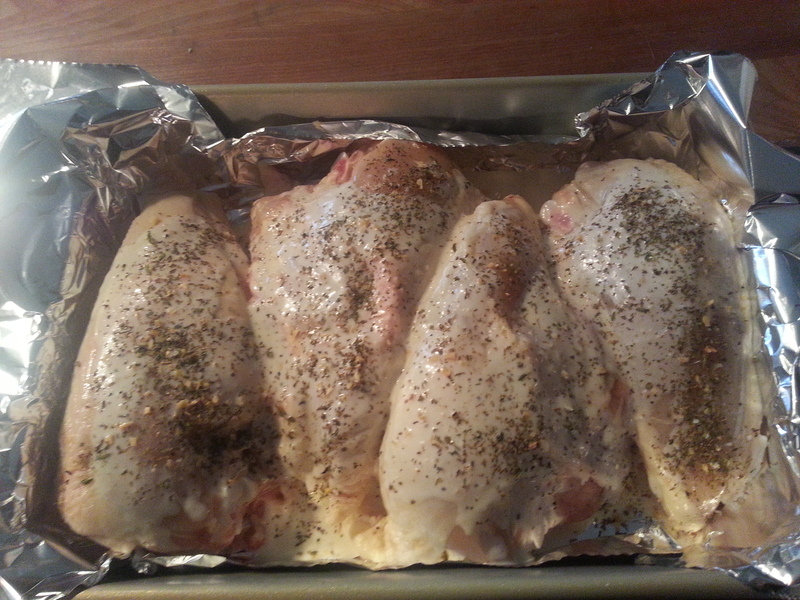 Getting the Chicken ready. Bake at 350F for an hour or more covered. 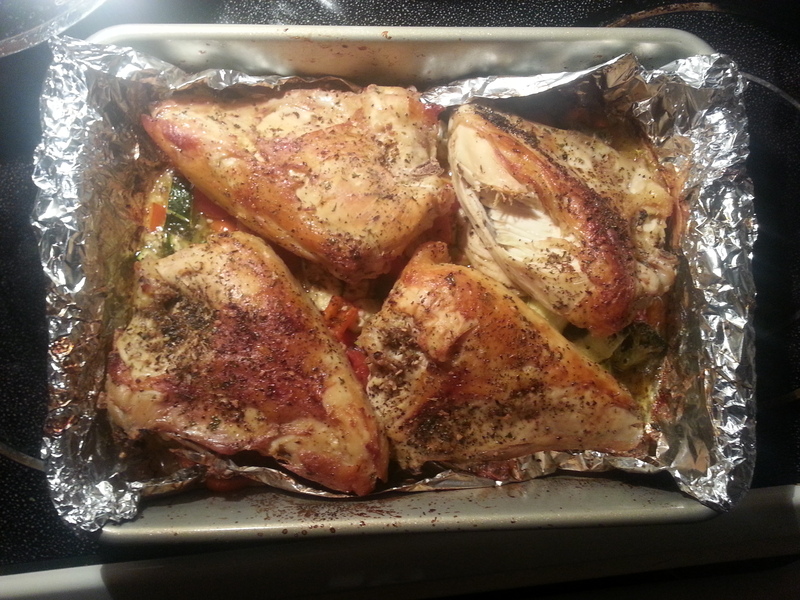 Add some Veggies under the Chicken. I had some Broccoli, Cauliflower leftover from our Veg-out Platter. 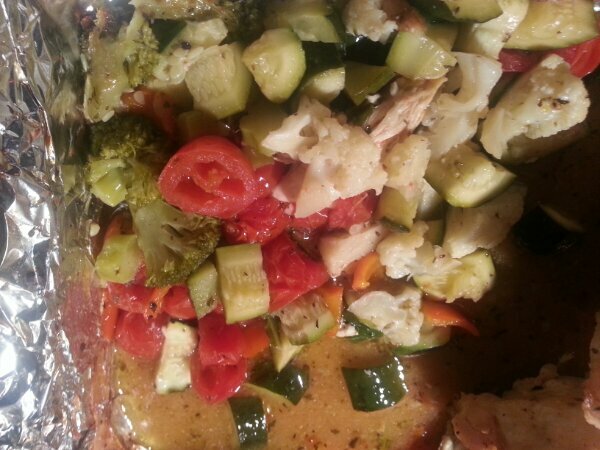 I also added some Zucchini and Grape Tomatoes. Cover and bake for 20-30 minutes more. Til veggies are getting tender. Uncover turn temp up to 365F to brown the Chicken. 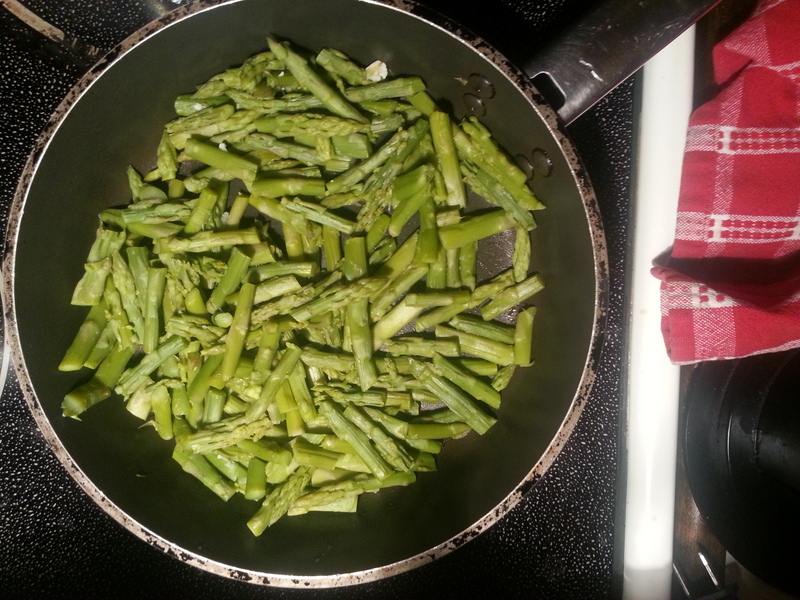 I had found some nice fresh Asparagus and the Dinner didn’t seem to have enough veggies for me. FYI: My Kid added Rice to his Dinner. As seen in the pic above. I packed some up for My Guy’s parents and for us for work. Left the rest in the fridge and guess what??? My Kid found it. SWEET 🙂 Time to make more this one will have Watermelon, Cantaloupe and Pineapple in it and ????? I’ve never had that combination. We will see. 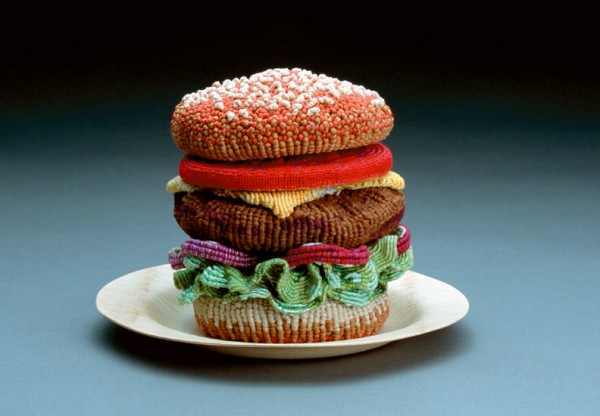 FYI: From my collection of Food Sculpture pics. Thank you, to the terrific talented Needler. I am in AWE! We had gone out for Breakfast, Oh, my how YUM. We split a French Toast Deluxe with Blueberries,Ham, and Scrambled Eggs. Our day then changed to running errands for My Guy’s Parents. So, by the time we got home all we wanted was a Movie n Movie time munch. 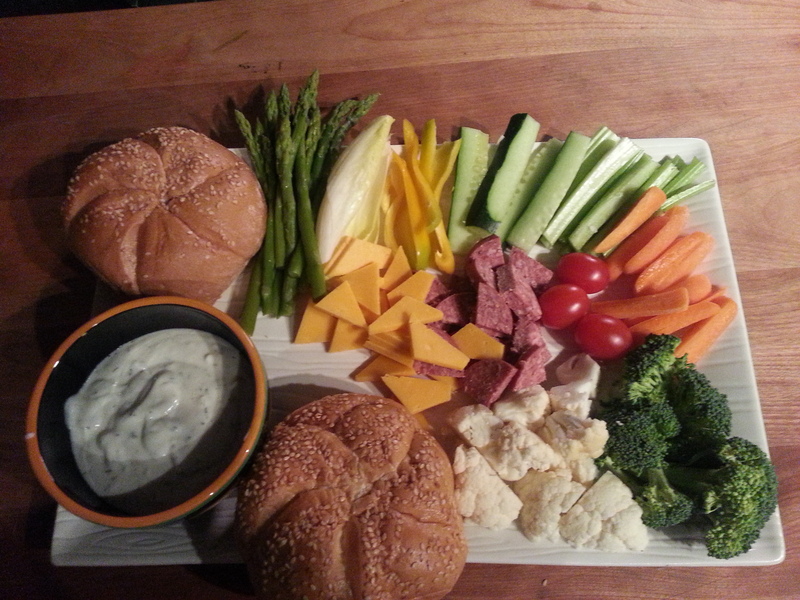 Fresh Baked Kaiser Rolls, Cauliflower, Broccoli, Sweet Peppers, Grape Tomatoes, Steamed/Chilled Asparagus, Endive, Cucumber, Celery, Carrots, Summer Sausage(for My Guy), Good Sharp Cheddar and a Simple Yummy Greek Yogurt Dill Dip. I make a container of this Dip every Weekend for our lunches during the week. 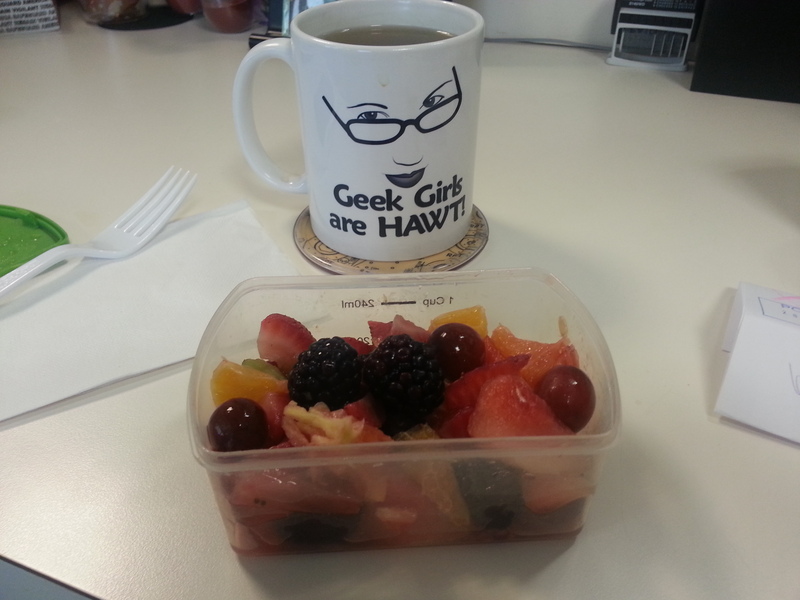 More on Weekday Lunches to come.